What Fruits or Vegetables are High in Potassium Besides Bananas? 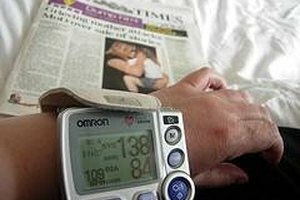 How High Can Blood Pressure Go? 1 What Fruits or Vegetables are High in Potassium Besides Bananas? 3 Is Brown Rice Good For You? High blood pressure, also known as hypertension, is a serious condition that often goes undetected. Allowing blood pressure to run too high can really do some serious damage over the years. High blood pressure can cause blindness and even destroy every organ in the body if it is not controlled with diet, exercise or medication. Keeping blood pressure in the normal range can help to prevent serious complications from arising later on in life. People who have high blood pressure have an increased risk of having a heart attack or stroke. Normal blood pressure is 130 for systolic pressure and 80 for diastolic. High blood pressure is considered to be anything over 140/80 because even if the blood pressure is slightly high, it can still do the same damage over the long term. Blood pressure can go as high as 220/120. These levels are dangerously high, and they can result in stroke, internal hemorrhage, cerebral edema or death. High blood pressure can be very taxing on the kidneys. When blood pressure is continually high kidney failure is likely to happen eventually. The kidneys filter blood and waste products through the urine. High blood pressure can damage the blood vessels within the kidneys until these organs are unable to do their job. High blood pressure is called the silent killer because it often has no symptoms. However, some people with very high blood pressure will develop uncomfortable symptoms such as headaches, dizziness and fatigue. There have been a few rare cases when blood pressure levels have exceeded 300. The heart is not capable of pumping blood any higher than this point. Should You Steam or Blanch Bean Sprouts Before Eating Them?